The vintage S1 Bentley, in pearl white, is an all encompassing luxury vehicle. This handmade, saloon style vintage limo is elegant, bold, and bound to turn heads. The sleek body is similar in style to the Silver Cloud Rolls Royce. The rear seating area has pull-down picnic trays and makeup mirrors, to allow our passengers to enjoy their special day. This unique limousine carries four passengers plus the driver. There is seating for three in the back and one in the front. This vintage Bentley was one of the first of this "new" body style. 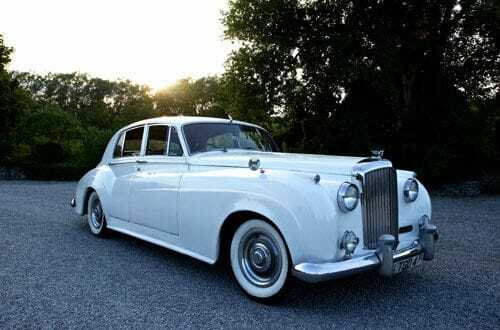 To book this 1956 vintage pearl white Bentley for your wedding or special occasion, contact us today!